While living in Saudi Arabia, I took off for two weeks to do a circumnavigation (by Fiat mini-sedan) of Greece's Peloponnese Peninsula. 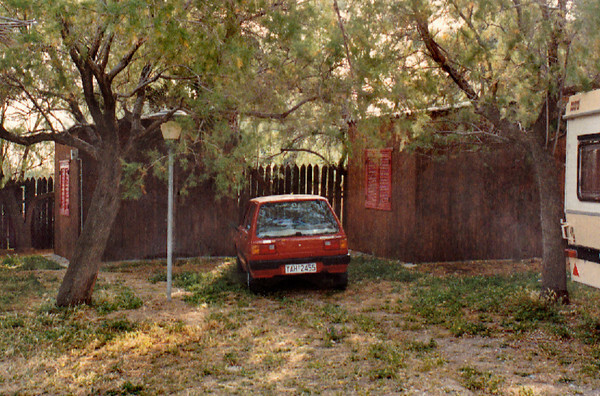 My rented Fiat parked next to the "hut" I rented overnight at the "Kamping Kreioneri" travellers camp in Akrata, Achaea Province in north Peloponnesus. The hut was very neat and tidy, but also very basic: a bed, night stand, and a cold water wash-up sink. However, the price was right at less than US$5 a night. The camp was owned and run by a charming German couple. It was here I learned that many German expatriates moved to Greece after WWII, having discovered the country's charm during the German Occupation. 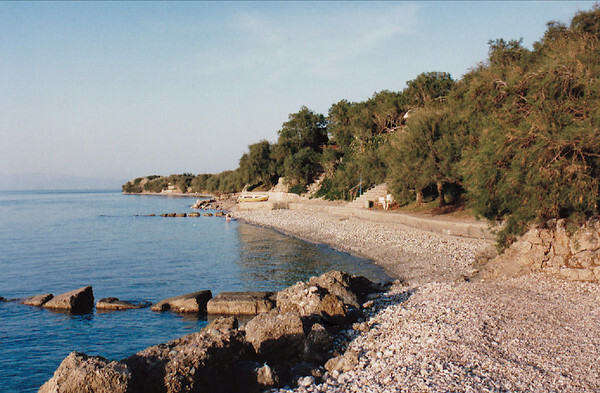 The private beach at "Kamping Kreioneri" travellers camp in Akrata, Achaea Province in north Peloponnesus. 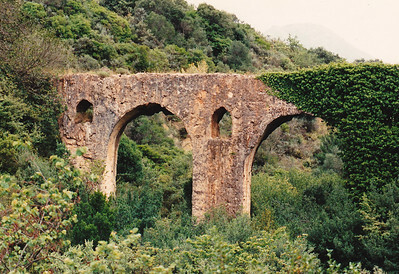 An overgrown aqueduct, Achaea, Peloponnesus. 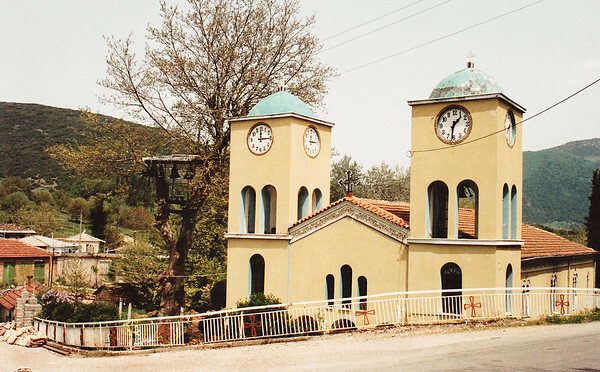 Twin bell towers of a village church, Achaea Province, northern Peloponnesus. Note the two differing times shown on the clock faces. 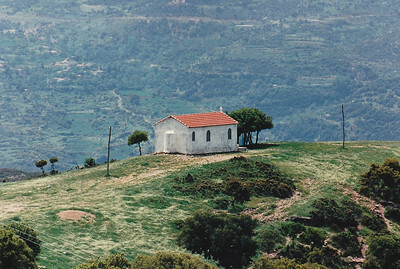 Hilltop chapel, Laconia Province, Peloponnesus. 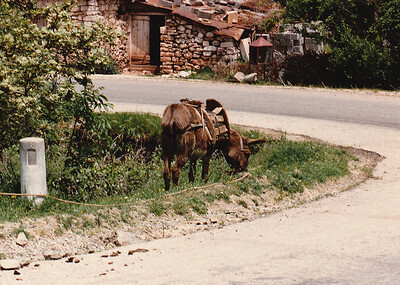 A local farmer's donkey tethered to a tree at a bend in the road, Laconia Province, Peloponnesus. An isolated monastery perched atop a steep cliff face, Laconia Province, Peloponnesus. 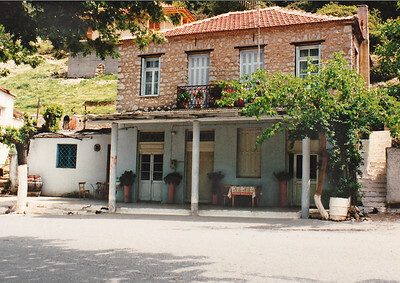 The village "Taverna", Laconia Province, Peloponnesus. 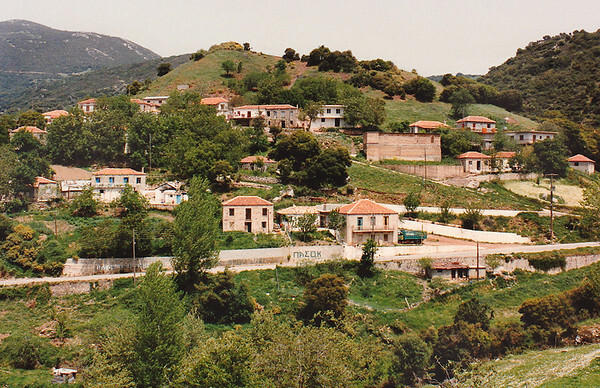 A fair-sized Laconian town stretched out along the roadside of the main provincial highway. 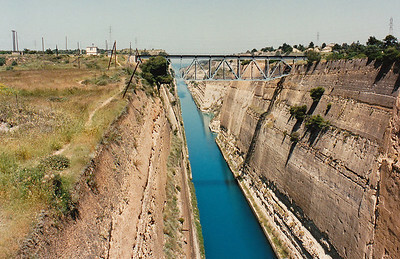 The Corinth Canal cuts through the Isthmus of Corinth and physically separates the Peloponnesian Peninsula from the rest of mainland Greek. It is a single channel 8 metres (26 ft) deep and 6.4 kilometres (4.0 mi) long, but only about 21 metres (70 ft) wide at sea level, making it unnavigable by most modern transport vessels. Completed in 1893. 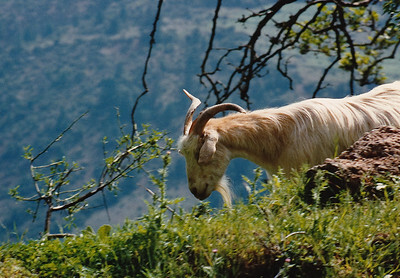 A domestic goat munching roadside greenery on the road to Mystras. 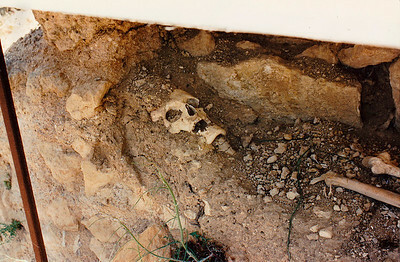 The excavation (near the Temple of Zeus site) of a single human grave, probably that of one of the site's inhabitants during the early Christian Era, Nemea, Corinthia Province. One of the onsite staff of the U.C. Berkeley archeological team indicate that it was the skeleton of a monk or other lower-rank cleric. 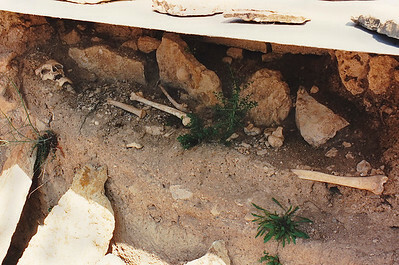 Close-up of the excavation (near the Temple of Zeus site) of a single human grave, probably that of one of the site's inhabitants during the early Christian Era, Nemea, Corinthia Province. One of the onsite staff of the U.C. Berkeley archeological team indicate that it was the skeleton of a monk or other lower-rank cleric. 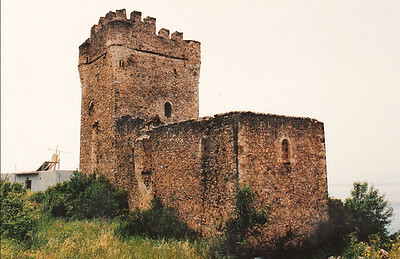 A typical Maniot Tower, located near Gythio on the Mani Peninsula of Sparta. About 20 meters high and has 4 to 5 floors. The more than 800 surviving Mani towers were very carefully planned. Used as a residence as well as a defensible military strong point, each tower included a high-walled courtyard. They were equipped with loopholes, boilers for water, and special places at tower corners for throwing stones at enemies. During the Ottoman invasion (circa 1770) of the Peloponnese Peninsula, the Maniots had a reputation as proudly independent warriors. They lived in fortified villages and house-towers where they defended their lands against the Ottomans until 1827, when the Ottoman invasion of Greece was stopped by the combined forces of Great Britain, France, and Russia at the Battle of Navarino at modern-day Pylos on the west coast of the Peloponnese Peninsula. 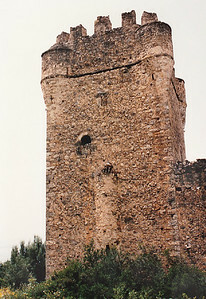 Close-up of a typical Mani Tower, located near Gythio on the Mani Peninsula of Sparta. During the Ottoman invasion (circa 1770) of the Peloponnese Peninsula, the Maniots had a reputation as proudly independent warriors. They lived in fortified villages and house-towers where they defended their lands against the Ottomans until 1827, when the Ottoman invasion of Greece was stopped by the combined forces of Great Britain, France, and Russia at the Battle of Navarino at modern-day Pylos on the west coast of the Peloponnese Peninsula. 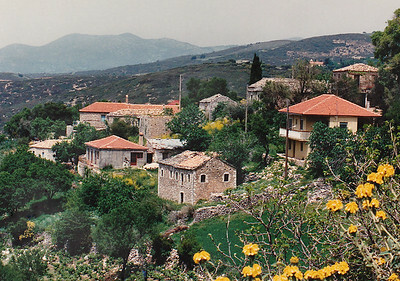 A typical Mani Tower, located near Gythio on the Mani Peninsula of Sparta. During the Ottoman invasion (circa 1770) of the Peloponnese Peninsula, the Maniots had a reputation as proudly independent warriors. They lived in fortified villages and house-towers where they defended their lands against the Ottomans until 1827, when the Ottoman invasion of Greece was stopped by the combined forces of Great Britain, France, and Russia at the Battle of Navarino at modern-day Pylos on the west coast of the Peloponnese Peninsula. 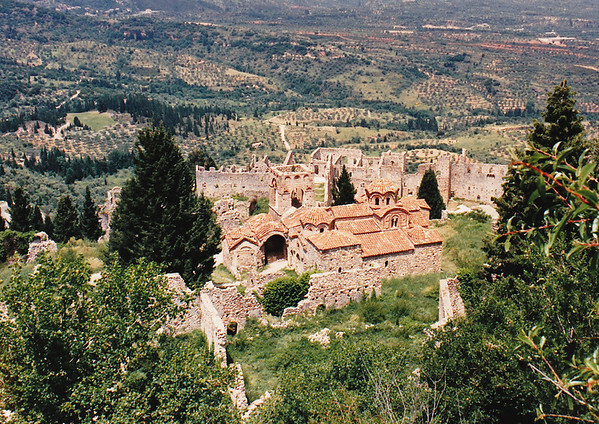 A panoramic shot of Mystras, near the modern city of Sparti in Laconia Province. Villehardouin's Castle and small palace surmounts the hilltop (upper right corner of photo). 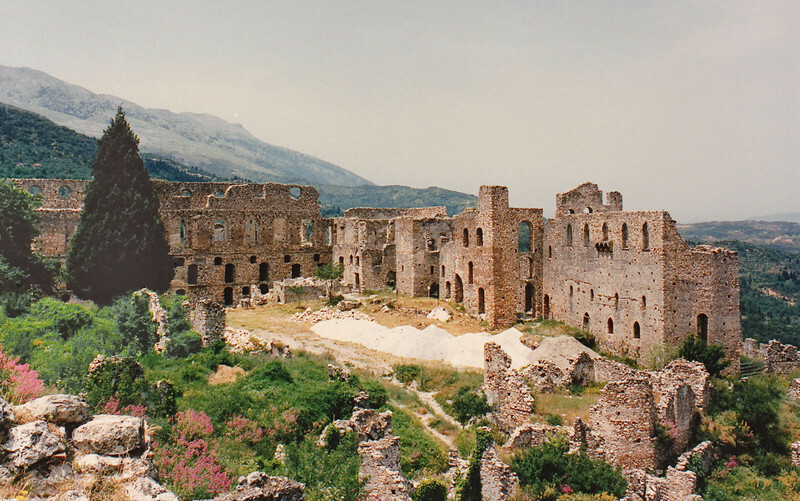 Built as an amphitheater around the fortress erected in 1249 by the prince of Achaia, William of Villehardouin. Reconquered by the Byzantines, then occupied by the Turks and the Venetians, the city was abandoned in 1832. 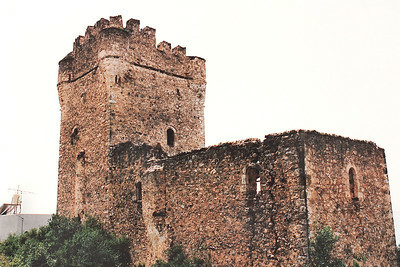 Link to Wikipedia's map PLAN OF MYSTRAS Link to UNESCO website: Archaeological Site of Mystras. 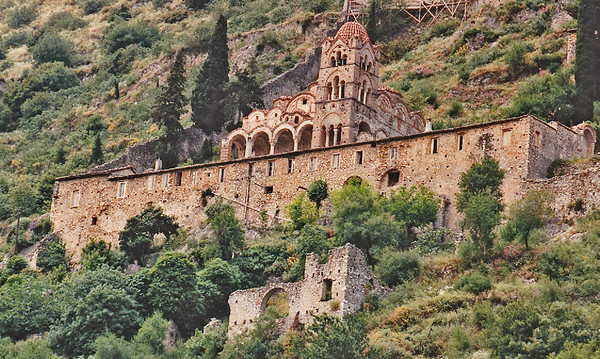 The Pantanassa Monastery of Mystras was founded by a chief minister of the late Byzantine Despotate of the Morea, John Frankopoulos, and was dedicated in September 1428. 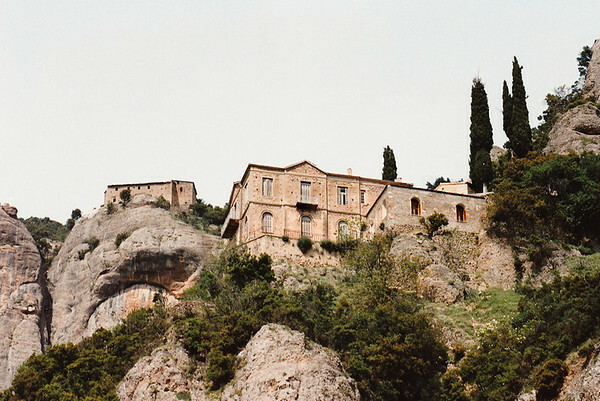 It is the only monastery on the site of Mystras still permanently inhabited. Today it is inhabited by nuns providing hospitality for tourists and other visitors. 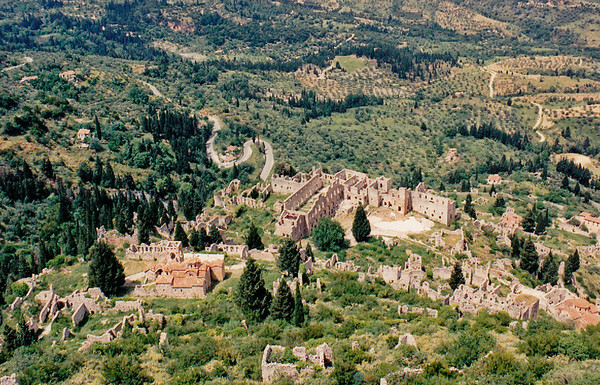 Mystras: The buildings of the Metropolis seen from above. 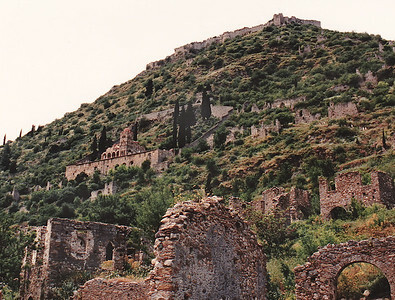 The ruins of the Despot's (or "Palaiologue") Palace, Mystras. The wall pierced by multiple arched windows (at left) is that of the Throne Room.